The American Mastiff is a new breed of dog developed by blending English Mastiffs with Anatolian Shepherds. 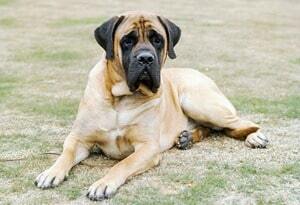 American Mastiffs are dignified and loyal, known for their reserved nature rather than their playfulness. They are protective, but relatively non-aggressive. They are very quiet in houses, and though they are large, they make excellent pets. They can adjust to many accommodations, prospering on either farms, houses with big yards, or apartments (as long as they receive adequate exercise). They will love their human family, particularly children, with which they are extremely gentle. They were originally bred to be personal protectors, and they take this job very seriously. They truly are gentle animals, though they have shown a tendency to be slightly combative with other dogs and strangers. Because of their size and training requirements, American Mastiffs are not recommended for first time dog owners. American Mastiffs will grow to heights in between 28 and 35 inches and can weigh as much as 200+ pounds. Their coats are very thick and short. Colors will vary, including fawn, apricot, and brindle, and all American Mastiffs have black facial masks. Their eyes are dark brown, and their ears are round, set very high on their heads. Their chests are extremely powerful, deep and broad. Their movement is strong and agile, graceful and confident. They require little exercise and grow very quickly. As a result, they sleep a majority of the time. Though they do enjoy walks, they are definitely not runners. American Mastiffs were developed by Fredericka Wagner of Flying W Farms. 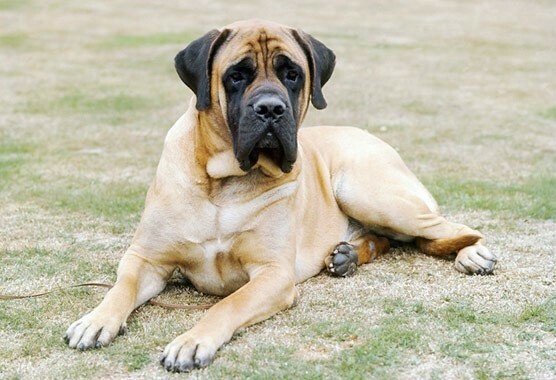 American Mastiffs are the result of strenuous work on her part, and only dogs which trace back to the Flying W Farms original line are true American Mastiffs.